Since 8 July 2014, when the Israel Defence Force (IDF) began ‘Operation Protective Edge,’ Israeli forces have reportedly killed seven journalists and media workers. PEN International condemns the killings and the reported deliberate targeting of certain journalists, media organizations and their infrastructures that have taken place during Israel’s offensive in Gaza. This wide spectrum of reporting is dependent upon the ability of journalists and writers to function in conflict situations. All governments are obliged to ensure that journalists are afforded their right to protection as civilians in a war zone. Since 8 July 2014, when the Israel Defence Force (IDF) began ‘Operation Protective Edge,’ Israeli forces have reportedly killed seven journalists and media workers and wounded another fifteen, six of whom were reporting on protests in the West Bank. The most recent killings occurred on 29 July, when – in separate attacks – the IDF struck the home of Ezzat Abu Duhair, a young correspondent with the Al-Huriya Media Network; he and four members of his family were killed. That same day, Bha’a al Graieb, the manager of the Hebrew news department of Palestine TV was killed by an aerial strike whilst taking his daughter to a hospital in Rafah City. 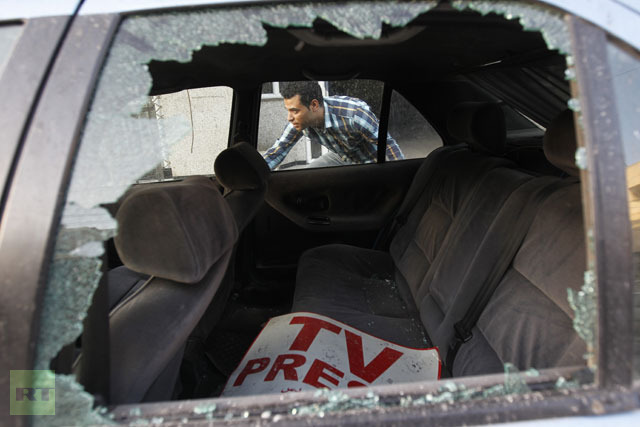 Media outlets have also been attacked or destroyed during the bombardment, including the offices of the National Media Agency, the offices of Wattan Radio station, the offices of Aljazeera TV and three offices belonging to the Hamas Al-Aqsa TV channel and radio station. Israel has issued a press release saying that it would not accept responsibility for injury to journalists or damage to equipment suffered during reporting from the field. International journalists can often alert the IDF to their positions – and so avoid some danger. Not all Palestinian journalists have the means to do this. The fact that some media serve as propaganda tools does not justify making them a military target. The deliberate targeting of journalists and media outlets is a violation of international law and denies reporters their right to protection as civilians in a war zone. Pen International promotes literature and freedom of expression. Founded in 1921, the global community of writers now spans more than 100 countries. PEN International is a non-political organisation which holds Special Consultative Status at the UN and Associate Status at UNESCO. To see the article on PEN International’s website, click here.